Author(s): H. N. Williford, FACSM, K. Gaston, M. R. Esco, M. S. Olson, FACSM. Auburn University Montgomery, Montgomery, AL. PURPOSE: More and more youth are participating in interactive video games that require some form of physical activity. There have been few studies evaluating youth and the energy cost and physiological responses of interactive video game systems.The purpose of this investigation was to determine the acute physiological responses in youth to the Nintendo Wii Fit video game system as compared to maximal treadmill testing, and to determine the exercise intensity of this form of training. METHODS:Ten participants (5 boys and 5 girls) with the following characteristics (mean ± SD): age (10.30 ± 1.06 yrs. ), height (142.0 ± 10.6 cm), and weight (34.7 ± 9.6 kg) were examined during two separate exercise testing sessions: maximal treadmill test to determine VO2 max (ml.kg-1.min-1), and Nintendo Wii Fit exercise test (18 min.). 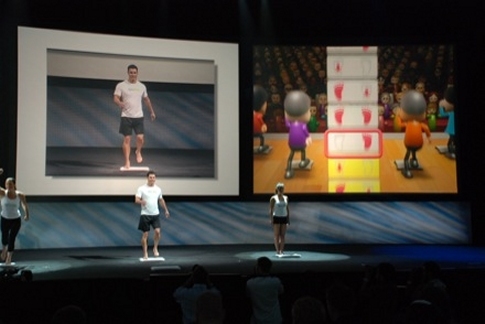 During the Nintendo Wii Fit exercise performance evaluation, 3 games were evaluated (hula hoop, running, and basic stepping). Each condition was played for a total of 6 minutes with 2.5 min. rest intervals between each condition. Participants also performed a modified Bruce maximal treadmill test. The physiological responses for both maximal treadmill testing and Wii Fit were determined by indirect calorimetry (Cosmed K4b2 ). Heart rate was monitored with a polar heart rate monitor. RESULTS: The results of maximal treadmill testing were VO2 max = 53.60 ± 6.24 (ml.kg-1.min-1), maximal HR = 201.0 ± 8.3 bts.min-1, RER = 1.27 ± 0.11. The responses to the Wii Fit hula hoop were: kcal = 3.16 ± 0.86 kcal.min-1, VO2 = 18.24 ± 4.94 ml.kg-1.min-1, HR = 137.00 ± 16.32 bts.min-1 .The responses to the Wii Fit running were: kcal= 3.45 ± 0.71 kcal.min-1, VO2 = 19.92 ± 4.07 ml.kg-1.min-1, HR = 134.00 ± 18.90 bts.min-1 . The responses to the Wii Fit basic stepping were kcal = 2.01 ± 0.37 kcal.min-1, VO2 = 11.57 ± 2.15 ml.kg-1.min-1, HR = 112.00 ± 10.59 bts.min-1. The metabolic responses for the Wii Fit were 31 percent of VO2 max and 63 percent of HR max. The average energy cost was 2.89 kcal’s .min-1. CONCLUSIONS: This investigation found that Wii Fit produced a mean metabolic response of 4.7 METS and a mean %HR max = 63% and %HRR max = 44%. According ACSM’s Guidelines for Exercise Testing and Prescription, the intensity level for Wii Fit would be classified as light to moderate intensity exercise.